Around the corner and down a bit from my house, a tear-down situation has occurred. The house, a sixties ranch that was pretty large (I know, because whoever lived there at one time had four children; my daughter baby-sat for them), is gone now. Unbelievably, so are several century-old trees. I wasn't the only one who watched in horror as the mighty oaks (could have been other types, too) came down. A neighbor posted his lament and disbelief on our neighborhood blog. Yesterday, I passed by, and there was one tree left, right in the middle of the giant corner lot. It was a Japanese maple in all its spring glory. As I've driven around these past few days, I've been bowled over by the colors of these trees, reminding me of what a good investment they are. You get two spectacular seasons of color - one when the new leaves unfurl in April and then again in the fall when some of the colors blind you, especially when backlit by the sun. But, the branching on the trees is also pretty in winter, and even though many turn plain green (my favorite color) in summer, you still have the beautiful texture. In the photograph above, you have a great example of how the deeply cut leaves on some varieties add a laciness to broader evergreens. The other day I was talking to Bill Hudgins, an inveterate Japanese maple collector who has ended up with literally hundreds of trees he's selected from seedlings and grown out in containers on his Atlanta property. He was selling them in the fall for $18, so I asked if he had any for spring planting. "I have hundreds and hundreds," he said with a laugh. "The whole thing just got out of control." The trees, most of which are six feet tall or better, are priced from $8.00 to $30.00. There's a discount on quantities. 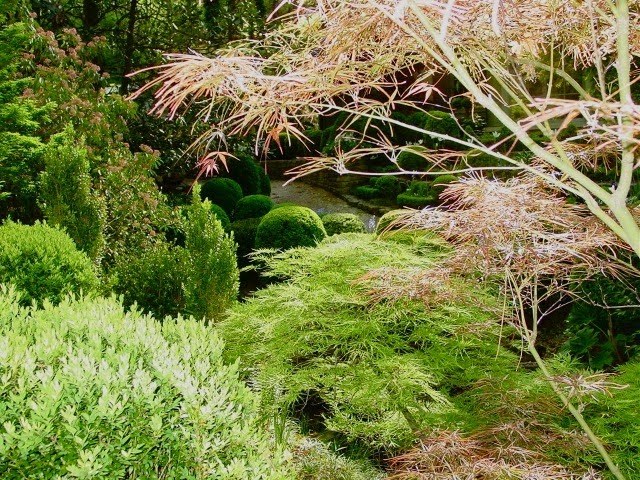 If you've bought a Japanese maple, you know this is an incredible bargain. They aren't named varieties, but Bill chose them for their leaf structure and color, so they will be more interesting than some of the more common. but pricey, cultivars in the trade. They are available now through Bill's shop, Lush Life at 146 E. Andrews Dr., Atlanta 30305. The phone number is 404-841-9661. I'll be interested to see if that big Japanese maple around the corner disappears. I'm thinking they are going to sell it to a landscaper or try to build around it. Since the rest of the lot is cleared, and the tree is smack in the middle of where you think a house would go, I'd bet my hat on the former. Meanwhile, a Japanese maple, as you can see in this photograph I took at Bill's house, is practically as showy as a spring-flowering tree or shrub. One of my favorite combinations ever (unfortunately, I only have it captured on a blurry slide) was a cut-leaf Japanese maple hanging over a stone wall. The new leaves were a rich burgundy-red. Cascading next to it was Rosa 'Red Meidiland' with a white center. That image is one I would copy if I had world enough and time (and a stone wall and some sun). Maybe someday. Anything is possible.